Relieved that we wouldn't be stuck in the classroom again (indoor recess is the pits when a roomful of second graders need nothing more than to run outside), I glanced out the window to see that the drizzling rain from the morning had stopped. Staying on the blacktop outside on the playground would be a good call. The ground was saturated from days of intermittent rain, meaning there would be puddles--full of mud--all over the place. And if the kids ventured into the mud, the mess inside the school would be unbearable. As an assistant in a second grade classroom, I not only help with their academics, but I am in charge of the students during their recess and lunch. A morning full of work finished, I ate a quick lunch in the lounge, then put on my coat and headed back to the classroom to pick the kids up. "ABC order, please. You should see the head of the person in front of you. Quiet in the hallway! Let's go." My demands were becoming second nature. Within minutes of stepping outside, I heard the screams from the kids who'd run ahead at full speed toward the blacktop. "Ewwww!" "Worms, oh I HATE worms!!!" "Yuck, don't step on them!" "Yes, Step on them, kill them!" I reached the end of the sidewalk and stopped: the large square patch of asphalt in the center of our outside play area had been transformed into a lake of worms. It seems every year there is a day when the water inside the ground becomes too much to bear, and the worm-world under the soil turns itself inside out. I was stuck for a moment in-between: my new life, versus my 'old life', which seemed like a thousand years ago. Had it only been one short year since the last time thousands of worms migrated to the surface of the earth, their homes saturated with snow melt and spring rain? Some kids hopped clumsily and others stepped gingerly around me, while my mind drifted back to the year before. One Year Earlier...I was still a daycare provider in my home, with just a handful of littles in my care. Our days were gentle, happy. When the snow melted and the relentless rain brought worms out, we delighted in it, stepping out in the drizzling rain to admire the spectacle. It seemed like the entire world had been smeared with worms--they were everywhere; the driveway, the patio, the sidewalk next to the garden. 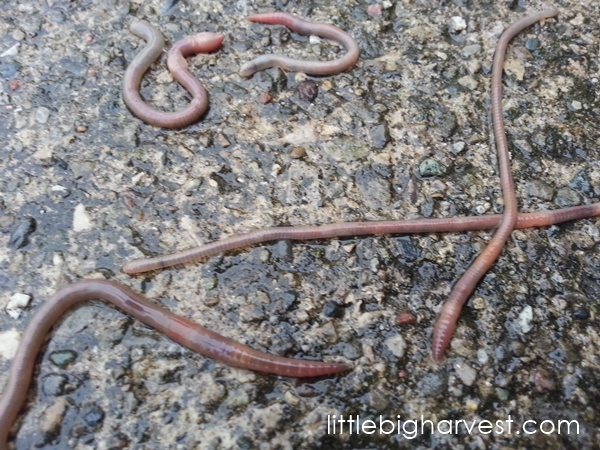 We bent down and watched them squirm, and I told the littles how much we owed to those worms. The worms are so important, I explained, not only to our garden, but to the entire earth. We should always love them. If we see one struggling to get out of a puddle, we should carefully pick it up and move it to dryer ground. Of course I went insanely over-the-top with the worm love, because over-the-top is what kids remember. I wanted the littles in my care to see worms in a new way, and not just think of them as a plaything, or even 'disgusting', but rather, crucial to our existence. "Mrs. P!!! I can't step anywhere...the worms!!! They are so gross!!!" The shout snapped me out of my daydream and I looked at my current charges. No longer a handful of them, but dozens. Kids I'd gotten to know during the previous seven months and who had changed my life. They had their teachers, who obviously had the most influence on them during the school days, but they had me and the other assistants as well. At the beginning of the school year, the only words I could find to describe my job as an assistant were demanding. Emotional. Exhausting. As the year has progressed and I've gained footing, I've found new words to describe my daily work: Deeply satisfying. Exhausting-but-worth-it. Hope-filled. My purpose. The range of experiences and emotions I'd had during the past seven months changed me profoundly, but made me realize; there is no where else I want to be but in a classroom. A child ran past and bumped into me, knocking me a bit off my footing. Watching the indiscriminate stomping and careening of children, I started to feel upset, like the over-sensitive softy I've been since I was a child myself. I started with the kids nearest me, holding my hands out as my feet stood still, fearing that I'd step on yet another worm. "Hold on a minute...let's talk about these worms. Do you realize all the work they do? Do you know how important they are?" Like a street vendor, I called out to whoever was near, repeating myself until several kids gathered around, curious. "Seriously! If we had no worms, we wouldn't have such nice soil for our grass and gardens and flowers. There would be garbage all over the place if the worms didn't eat it up." Skeptical glances came my way, and couple kids jumped off, their attention already gone. A few other kids stayed close, their curiosity piqued. "But Mrs. P, they are gross. They are slimy. Who cares if we squish them." I turned to Gabe, one of my more soulful students. "Gabe, I have a job for you. Would you like to help with a rescue mission? Let's see how many worms we can move over to the grass. We NEED worms. And right now, they need us." Most kids adore being given a job, any job, to feel important and needed. Gabe practically saluted me before he bent down to start picking up worms, tentative but determined. Of course, upon seeing another student doing something important, several other kids instantly bent down to grab their own worms. I had to stifle a giggle--sometimes kids are just so predictable and easy. For the next 10 minutes, a worm rescue effort bloomed. At least ten kids helped, piling worms in the safety of the grass, where they would no longer be vulnerable to the feet of running and jumping children. It was too late for many worms, and we passed them over with an appropriate amount of solemnity. A blur of other kids ran by us, completely oblivious, but my focus was on those who stopped to help. "Do worms have eyes?" "Are there baby worms?" "What do they eat?" "How do they move without legs?" A couple kids were looking more closely at the objects of rescue in their hands, trying to find answers instead of squealing with disgust. It was more than I could ask for, these thoughtful reflections! I answered the questions to the best of my ability. As we worked I told them I had a worm farm in my living room. A couple girls made gagging sounds, but several other kids looked at me with astonishment. "A worm farm? Wow!" I have no idea what they may have imagined a worm farm to look like--perhaps in their minds it was complete with a little red barn and a field of mini-hay--but I promised to bring in a photo to show them. I told them how the worms ate up some of my garbage and gave me beautiful garden 'vitamins' in return. They were quiet, but I could tell they didn't quite believe me--BUT, I'd gotten their attention. That first crucial step in learning something new; undivided attention. Recess ended. We lined up. 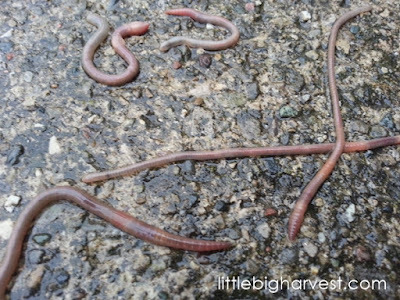 The worm rescue was abandoned, but not before we'd saved many of the doomed creatures. I was satisfied and rejuvenated. Perhaps this new job has challenged me to the point of breaking, and perhaps my heart shattered a little at leaving behind my daycare and my constant access to home and garden--but a piece of the old me resurfaced during this recess. 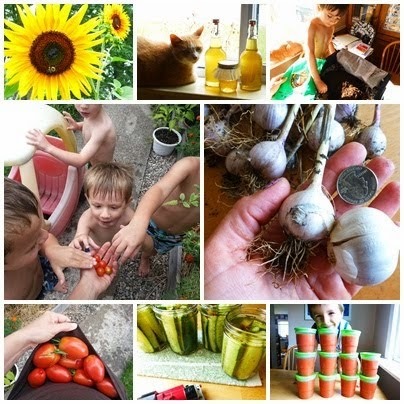 The nature lover and garden addict in me reveled at the way the kids soaked up the short lesson on worms, and I gleefully planned for the books I'd bring in for the kids to read during silent reading, the photos of my worm farm I'd share. For a moment, I was able to reach into kids' innate nature-loving little minds, like I'd been able to at home for so many years with my daycare kids. I know I will eventually teach in my own classroom--hopefully soon. Getting back into the public school system seemed like jumping into an icy lake at first, compared to the comfortable warm pond I was used to at home. I'm becoming more accustomed to this different, but equally powerful job, day by day. I love these kids like mad, ALL of them, even those who make teaching extremely difficult. I know that I am helping many of them reach academic success. I also know I have the power to pass along some deeper life lessons about our world along the way. The future classroom in my mind is one that is filled with questions, wonder, and connections--I can hardly wait. For now, I can relish my role as that kinda-weird-assistant who likes to talk about nature and plants and worms. I followed the rest of the kids inside, gave a final glance to the gloomy afternoon and the pink-mottled blacktop, and took a deep breath. 'Let me get through the rest of this day', I pleaded in my mind, and then I silently thanked the worms for coming out to remind me of who I am, deep inside. Not even a week later, we had another worm-on-the-blacktop recess. I waited to see what would happen. Within minutes, a group of kids had come toward me, perhaps wanting to see what I'd do. I didn't say a word...and I didn't need to. I listened as students began to talk to each other about worms and what they do, and to please don't squish them! When they instructed each other to be careful and when they started to rescue some of the big, healthy worms, I remained quiet but pitched in to help. My silent smile reached all the way into my heart. It would be perfect for preparing worm compost. It is a healthy food for my crops.